A-HOTEL.com - Luxury and cheap accommodation in Uglich, Russia. Prices and hotel, apartment booking in Uglich and surrounding. This indicative offer was derived from the most recently booked accommodation in Uglich and sort by the price, from cheapest Uglich accommodation to the most expensive hotels. To select accommodation by your preferences we recommend to choose from 20 accommodation offers in Uglich in total. By entering the dates of your overnight stay in Uglich and using the filter tools you can sort the best possible accommodation for you. The entered dates of your stay are crucial for the most accurate offer as it derives all the online information on pricing and availability of Uglich accommodation. Then you can book the selected Uglich lodging (hotels, apartments etc.) immediately. Offering a terrace and Russian steam bath, Terem Guest House is a self-catering accommodation located in Uglich, 500 metres from the Volga River embankment. Free WiFi and free parking are provided on site. Standing directly on the Volga River, this hotel features an indoor pool, a traditional sauna and an open-air café on the water. Uglich Fortress is a few steps away. Located in Uglich, a 2-minute walk from the bank of the Volga River, Hotel Voznesenskaya features a restaurant, bar and free WiFi. Private parking is available on site. Set back from the Volga River in Uglich, Moskva Hotel is a 5-minute walk from the Kremlin Cathedral. There is a spa with indoor pool, sauna and gym. Hunter Village is located in Ulyanovo Village close to Uglich and offers a Russian steam bath and a Finnish sauna. Free private parking is available. Located a 10-minute walk from the Volga River embankment in Uglich, Mini Hotel Fleur features a spa and wellness centre with hammam. Free WiFi and free parking are offered on site. Situated in Uglich in the Yaroslavl region, Apartments River Nest has a balcony. It features river views and free WiFi. Located in Uglich, Duk Hotel offers free private parking. All rooms come with a TV. Apartments on Komsomolskaya 8 is a detached holiday home with a barbecue, located in Uglich in the Yaroslavl Region. The property is 30 km from Myshkin and boasts views of the garden. Holiday Home on 1-y Rostovskiy pereulok is situated in Uglich and offers barbecue facilities and a garden. This holiday home offers a 24-hour front desk and free WiFi. This hotel is located in Uglich, a 10-minute walk from the Uglich Kremlin. Free Wi-Fi, an indoor pool, a tennis court and a spa centre are featured at Hotel Chaika. Set in Uglich, квартира offers accommodation with a balcony and free WiFi. Guests staying at this apartment have access to a fully equipped kitchen. Offering a barbecue and children's playground, Breeze Baza Otdiha is set in Uleyma in the Yaroslavl Region, 20 km from Uglish. The hotel has a sauna and a private beach area, and guests can enjoy a meal at the restaurant or a drink at the bar. Apartment near Volga river is situated in Uglich. Guests may enjoy the free WiFi. Boasting a shared lounge and free WiFi, Hostel Uley is located in Uglich. Guests can enjoy city views. Boasting accommodation with a balcony, Apartment on Yaroslavskoye shosse is located in Uglich. This apartment also features free WiFi. Located in the old Russian town of Uglich, this 3-star hotel offers a traditional Russian café and 24-hour reception. The Volga River and Uglich Kremlin are within walking distance. 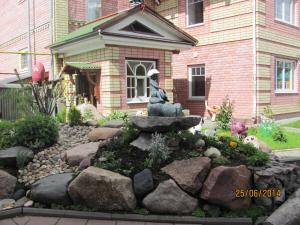 Featuring a garden and free WiFi, Postoyaly Dvor Inn is located in Uglich. All rooms feature a TV with satellite channels and a private bathroom. Set in Uglich in the Yaroslavl region, Гостевой дом has a garden. The accommodation is 24 km from Myshkin. Situated along the Volga River in the quiet village of Uglich, Guest House Kupechesky offers a self-catering cottage with traditional Russian design, a patio and BBQ facilities. It also features a sauna and children’s playground.